August | 2016 | TALK & OPINIONS BY SILVIO CANTO JR. Guest: Richard Baehr, Chief Political Correspondent at American Thinker and political columnist, will join us for a look at the Iran nuclear deal a year later……….were ransom payments made to Iran for the release of hostages? 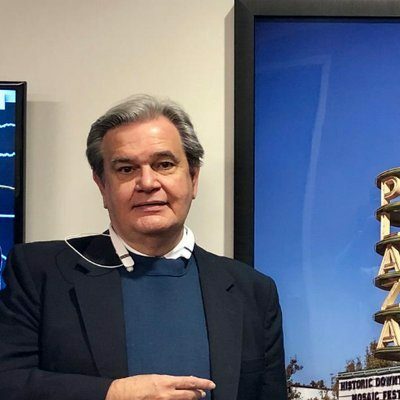 more cash deliveries to Iran…..Russian planes taking off from Iran air bases……Iran purchased anti-aircraft missiles to protect its nuclear facilities….is Iran gaining more influence in the Middle East………what is the status of the nuclear deal today? ……..and more stories……..
August 31, 1959: Sandy Koufax and 18 strikeouts! From 1962 to 1966, Koufax executed what are arguably the five greatest seasons by a pitcher in baseball history. Newfound control limited his walks from 4.8 per game to just 2.1. He threw no-hitters in 1962, 1963 and 1964, and led the Dodgers to World Series wins in 1963 and 1965 and the National League pennant in 1966. He won four World Series games, with a .95 earned run average and 61 strikeouts for his postseason career. Koufax won three Cy Young Awards (1963, 1965 and 1966), all of them unanimous. In 1965 he struck out 382 men, breaking Rube Waddell’s 1904 record of 350 by 32. According to longtime Dodgers broadcaster Vin Scully, Koufax was so well-regarded that he would often receive a standing ovation from fans while just warming up for a game. Sandy Koufax retired after the 1966 season at just 30 years old because of arthritis in his elbow. He was elected to the Hall of Fame in 1972. Koufax, along with team mate Don Drysdale, were one of the best 1-2 punch in major league history. Where is the black Democrat telling Colin Kaepernick to shut up? 2) He does not have a clue of what repression really is. My friend Humberto Fontova told me about Kaepernick holding a press conference wearing a T-shirt with a picture of Fidel Castro. It explained everything that I needed to know about this clown named CK who can’t play QB anymore. Furthermore, it also proved that Kaepernick does not even understand what is going on in U.S. cities, especially as it relates to the minorities that he is suddenly so worried about. Maybe he should get out of his mansion and spend a few days living in the inner city. Blacks are killed by police at a lower rate than their threat to officers would predict. To cite more data on this point: in 2013, blacks made up 42 percent of all cop killers whose race was known, even though blacks are only about 13 percent of the nation’s population. It ain’t happening, Colin. You are reading our society’s problems as poorly as you do the defenses intercepting your passes or the receivers that you are constantly overthrowing! Here is the worst part: His message of black victimology was unchallenged. No one in the Congressional Black Caucus stood up and called Collin out. No one in the Democrat Party defended the police from the outrageous lies that Kaepernick said. In the meantime, Chicago has recorded 487 homicides and more than 2,800 people shot so far this year. My guess is that the people in those communities are happy to see “the blue team”! At the end of the day, who cares whether Kaepernick salutes the national anthem. Let him sit down! However, he has no right to attack the integrity of our police officers or pretend to be enlightened by wearing a Fidel Castro T-shirt! Tagged with Where is the black Democrat telling Colin Kaepernick to shut up? 1941 was the year of DiMaggio’s 56 game hitting streak, the last summer of peace and Ted Williams ended up with a .406 batting average. The eventual seventeen-time All-Star began the season going one-for-one with a 1.000 batting average. Over the rest of the season, his average never fell below .308, and was almost always over .400. In fact, on July 24, it stood at .397. It would never again fall below .400. Williams wrapped up 1941 at 185-456, good for an average of .406. While Williams’ batting average garnered all of the attention in 1941, he also led the league in home runs (37), base on balls (147), runs (135), slugging average (.735), and on base percentage (.551). But here is the best part of the story. This is where this goes from another baseball story to a triumph of character. Inside his room at Philadelphia’s Ben Franklin Hotel on Saturday, Sept. 27, 1941, Ted Williams was jumpy and impatient. That might have been an apt description of the mercurial Williams at most times, but on this evening he had good cause for his unease. His batting average stood at .39955 with a season-finale doubleheader to be played the next day at Shibe Park, home of Connie Mack’s Athletics. Since batting averages are rounded to the next decimal, Williams could have sat out the final two games and still officially crested baseball’s imposing .400 barrier. So he went 6 for 8 and crashed through the .400 barrier. As we learned later, Williams had many character flaws.He wasn’t the nicest guy in the clubhouse or with the media. He couldn’t even return a salute to the fans at Fenway who cheered his last at bat, a home run, naturally. Nevertheless, his performance in the last game of 1941 is a lesson for us all. He could have sat out the double header and hit .400, or the rounded version of .3995. Instead, he put everything on the line and came out with a .406 average. Love him or hate him, I have to love that he was not afraid to put everything on the line. As the son of Cuban immigrants, I know a bit out putting everything on the line. I watched my parents do that several times. Maybe that’s why I admire that quality in Ted Williams so much. “Stengel’s real fame came as a manager. Though he had only middling success with the Brooklyn Dodgers (1934-1936) and Boston Braves (1938-1943), he managed to score a job with the New York Yankees in 1949 to replace the retiring Joe McCarthy, the winningest manager in major league history. Where he had previously managed only struggling teams, Stengel now had a roster of great players at his disposal. He made great use of platooning players, sitting right-handed hitters against right-handed pitchers and vice versa. His record of 1149 wins versus 696 losses with the Yankees over the next 12 seasons was among the greatest in managerial history, and included 10 American League pennants and seven World Series victories. 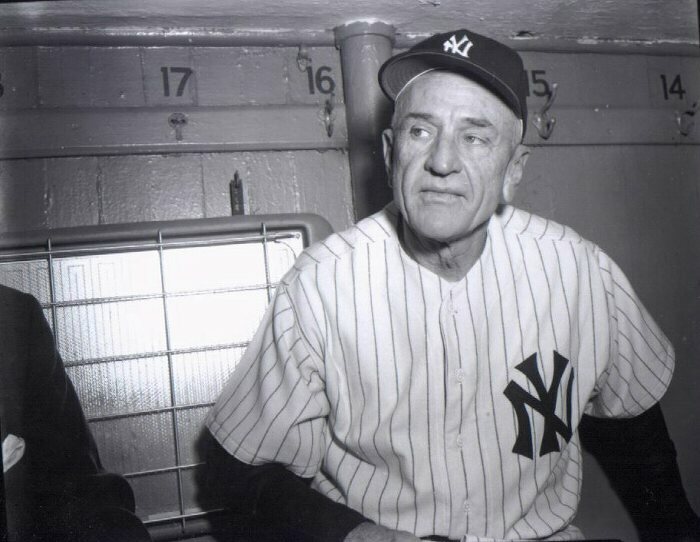 After a heartbreaking loss in Game 7 of the 1960 World Series to the Pittsburgh Pirates, however, the Yankees replaced the 70-year-old skipper with Ralph Houk, believing Stengel was simply too old to manage. He was quite a character as well as an amazing manager. I think that people were quick to say that he had a great team. However, he had a good sense for managing a pitching staff. He almost invented the platoon system and pitching situations, i.e. lefty pitching to lefty.